Nursery age children are set to be enthralled by the enchanting tale of the Snail and the Whale. The award-winning story is being used by storytellers from education innovators PiCL (Partners in Creative Learning) to encourage children in Stoke-on-Trent to foster a love of reading. A programme of drama and storytelling workshops is being staged by PiCL at the West End Centre, Stoke. There are further plans to stage workshops in community venues in Fegg Hayes, Hanley and Bentilee after PiCL won a bid for Children in Need funding. 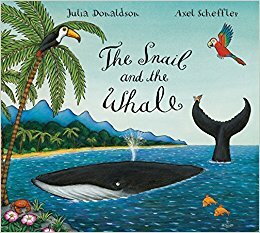 PiCL Director Erica Love said: “The Snail and the Whale, by Julia Donaldson, is a thrilling story of a tiny snail who hitches a ride on the tail of a huge whale in an effort to see the world. “Our programme will bring the story to life in a programme designed to engender a lifelong love of reading in the city’s children. Around 150 Stoke-on-Trent nursery-aged children are set to benefit from the Snail and the Whale project. PiCL is a community interest company offering a range of consultancy, training and development opportunities to children and adults. To get involved either email info@picl.uk.com or call on 01782 454773.